Chain stitch is a style of embroidery. It is called so as in this stitch, small loops are formed that appear to be like a chain. This stitch has many different names. It can also be called point de chainette or tambour stitch. The origins of this stitch lie in Persia and India. This stitch is in many types of embroidery. It is done using a needle or the hook of a crochet needle. Making a slipknot. Start the process by making a slipknot. 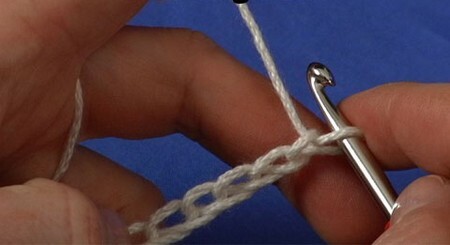 This is the most basic knot that is made when crocheting is done. To make one, tie an end of your yarn in a small loop. Insert the hook of your crochet needle into this loop. You are now ready for the chain stitch. Positioning your hands and fingers. For a good grip and flow as you crochet, your hands and fingers must be in the correct position. Take a length of your yarn, which you are using. Wrap this round on your pinky finger. Put this under your next two fingers and on the top of the pointer finger of your hand. The yarn will go alternately through these fingers. The slipknot is to be held between the thumb and the middle finger. Doing the chain stitch. Adjust your hook to loosen the yarn on it. Pull the hook towards yourself through the hole in the slipstitch. As the yarn is pulled through the hole, very carefully pull the knot that is present between the thumb and the middle finger to fasten the chain stitch made and tighten the same. One chain stitch has now been made by you. Continue the same process till you get a chain formed. While starting the second chain, insert the hook of the crochet needle through the first chain made by you. This is how you can chain stitch easily with a crochet needle. Practice to get the chain loops of a uniform size such that they are neither too loose nor too tight. Once you get used to it, your mind and hands will automatically adjust to it as a reflex. When you achieve perfection in the basic chain stitch, you may learn many others like double crochet, treble, half treble, double treble, triple treble and so on. Many websites offer to help you with these various stitches of crochet. After learning these you can start to make hats, purses, tablecloths and other such creative work from crocheting.